The definitions and other information contained herein are not exhaustive. Rather, they are provided to acquaint a person unfamiliar with such terms. Assembly machine: a single machine or a group of machine that receives multiple incoming parts to combine them into a single assembly or subassembly. Assembly machines can incorporate such processes as pressing, welding, forming, riveting, adhesive bonding, melting, and others. Hydraulic press: a power press that actuates its slide(s) with hydraulically actuated pistons that are supplied with high-pressure oil from a remote, electrically driven hydraulic pumping system. Integrated system, also known as a production line, manufacturing cell, or flexible manufacturing system: generally comprises a group of metal forming and/or metal cutting machine tools, sometimes from different suppliers, with the objective being to manufacture a desired product in a specific sequence of interrelated operations for mass production. Integrated systems typically include the machines, tooling, electric and hydraulic control systems, safety guarding, coolant systems, fume exhausts, or other equipment required to comprise the system as specified by the supplier or the customer. Integrated systems can be fully or semi-automatic, requiring some manual loading, unloading, or other intervention. Lathe: a metal cutting machine tool that grips a round or other workpiece in a rotatable, motor-driven clamping device called a chuck. The lathe then precisely moves a cutter against the outside or inside of the workpiece to "peel" the metal under the cutter's point, leaving a rounded, smooth surface on the workpiece. Generally, multiple cuts, or "passes," are required to obtain the final, desired diametral dimension. Lathes can machine metal, wood, or other materials. The material removed from the workpiece is generally in the form of curled "chips" that fall into the lower portion of the machine for subsequent removal and disposal. Computer Numerical Control, or CNC lathes rely on computer controls to select and position tools, and to rotate the spindle and chuck in controlled directions and speeds. Machine tool: a heavy-duty, generally floor-mounted machine that manufactures other machines and parts of machines or other devices by precisely positioning tooling against raw material. Processes performed by machine tools include machining (turning, milling, drilling, etc. 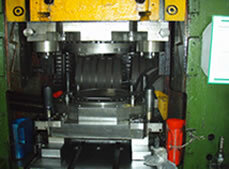 ), molding, press forming, injection molding, thermoforming, forging, rolling, roll forming, assembly, and other processes. Machine tools can vary in weight from a few hundred pounds to millions of pounds. Machining center: a variation of a milling machine that generally is complex, with provisions to hold several selectable tools in a storage area for automatic change during CNC programmed operation. Typically, such tools are operated one at a time by the machine, in a specific sequence, thereby allowing the machine to perform multiple programmed operations without manual intervention. Machining centers also can contain provisions for automatic part loading. Mechanical press: a power press that actuates its slide(s) with a mechanism driven by an electric motor. Metal cutting/material cutting machine tool: a machine that incrementally cuts or "carves" material from a piece of metal or other material to precisely reduce the size of the material to obtain a final contour. A metal cutting machine tool precisely actuates tooling in the form of clamping devices and cutters to perform its operations, and can be actuated by manual or computer numerical control (CNC) methods to position the cutters relative to the workpiece during operation. Metal cutting machine tools include lathes, milling machines, drilling machines, machining centers, and others. Metal forming machine tool: a machine tool that powers and positions specific tooling to form, rather than cut, metal. Forces applied to the workpiece can be substantial. Metal forming machine tools include mechanical and hydraulic power presses, bending machines, hydroforming machines, roll formers, metal spinning machines, expanders, forging machines, parts formers, and others. Milling machine: a machine tool that rotates a cutter against a non-rotating workpiece. Milling machines are typically used to manufacture parts of rectangular and irregular shapes. Milling machines can machine metal, wood, or other materials. The material removed from the workpiece is generally in the form of curled "chips" that fall into the lower portion of the machine for subsequent removal. Computer Numerical Control, or CNC milling machines rely on computer controls to select and position tools relative to the workpiece, and to rotate the spindle and cutter tooling in controlled directions and speeds. Power press: a machine that powers and positions tooling that is generally used to shear, cut, bend, forge, form, or perform other operations on material. A transfer press is a power press with positions for multiple tools to perform operations sequentially on workpieces that are transferred from station to station. Special machines: machine tools that are typically custom designed to manufacture a limited range of products to a customer’s specifications. Special machines are frequently custom built to customer orders. Special machines include some metal forming, metal cutting, painting, riveting, welding and assembly machines, and can include automations, testing stations, robotic feeds, and other apparatus to perform the desired operations. Special machines are typically used by automotive and other manufacturers to mass-produce products efficiently. Tooling is a general term used in manufacturing to describe the elements installed in machine tools to actually contact the workpiece to make desired changes in it by the specified operation. Tooling is generally removable and is also perishable, requiring replacement from time to time due to breakage and normal wear and tear. Examples of tooling include press tools and dies, lathe chuck jaws, clamps, lathe cutters, workholding devices, drills, milling cutters, forging dies, plastic injection molds, thermoforming dies, rollers, and many others. Tooling is an expression also widely used in the automotive industry to generally describe equipment otherwise known as special machines, production lines, and integrated systems.